On February 1, 2019, Detectives with the Montgomery County Sheriff’s Office, Special Victim’s Unit were contacted in reference to allegations of sexual abuse of a 13 year old girl. Detectives identified the suspect as 61 year old Jose Armando Lopez Solorio, and learned that he was employed as a grounds maintenance helper with the Pasadena Independent School District. Solorio was located at a family member's residence in Houston, and taken into custody with the assistance of the Houston Police Department. At the time of his arrest, detectives found that Solorio was babysitting small children, whose parents were not on location at the time of the arrest. The Pasadena ISD Police Department was notified of his arrest. 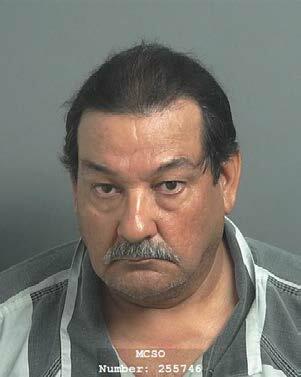 Solorio was transported to the Montgomery County Jail, and was booked on a warrant for Continuous Sexual Abuse of a Child. During an interview with the detectives, Solorio admitted to the original charges and provided additional information that led to an additional charge of “Super” Aggravated Sexual Assault of a Child. Aggravated Sexual Assault is upgraded to “Super” Aggravated Sexual Assault of a Child when the victim is either under six years of age, or if someone previously convicted of Violent Sexual Assault of a victim under the age of fourteen commits the same crime again. Investigators discovered that the abuse began when the victim was four to five years of age. Immigration and Customs Enforcement contacted detectives during the booking process, and advised that Solorio's immigration status would likely be reviewed due to the fact that he engaged in these crimes within the United States prior to receiving his residency status. Anyone with any further information, including any possible additional victims are asked to please contact the Montgomery County Sheriff’s Office at 936-760-5800.